Bobby’s a classic urban teenager. He’s restless. He’s impulsive. But the thing that makes him different is this: He’s going to be a father. His girlfriend, Nia, is pregnant, and their lives are about to change forever. Instead of spending time with friends, they’ll be spending time with doctors, and next, diapers. They have options: keeping the baby, adoption. They want to do the right thing. 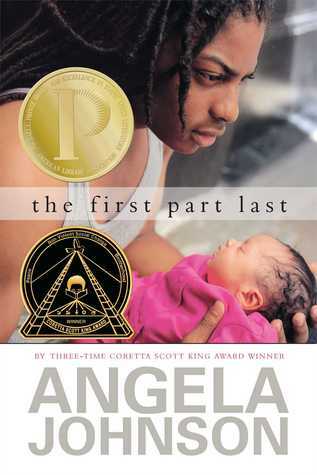 I read this book for the first time when I was 16 and I have never forgotten it. But before I get into the why and before I get into the re-read, I want to bring up something I noticed. I was going over previous reviews of this book and saw that the first review was that it was sleezy. contemptibly low, mean, or disreputable:sleazy politics. My issue with using this term for this book is there is nothing sleezy about this book. The topic isn’t sleezy, the wording isn’t sleezy and oddly enough Bobby isn’t sleezy. The situation isn’t even sleezy. If you feel that this book is glorifying a male’s role as a parent where these are things he should already be doing then okay but that still isn’t sleezy and I honestly believe that the person who wrote that review didn’t know what that word meant. Sleezy is one of this words that no matter when or how you use it, a person will always see something dirty, gross and not worth their time. Even re-reading it, that term should not have been used for this book. Because nothing about what happened in the past or present makes the book sleezy. As I mentioned I first read this book when I was 16. I was working as a page at my local library and it was a short read which is why it caught my attention. I did not know that this was book two to the Heaven series. And even now knowing that, you don’t need to read the previous book in order to understand and enjoy this one. Bobby is sad and even though I know the reason for his sadness, it still hits me because it is not for what you think it is. What I enjoyed about this was the author never has Bobby say that he is sad but you see it when you picture his face. You hear it when he speaks. And I felt for him because when I saw Bobby, on happier times, I picture him with the most beautiful smile I have ever seen. Kind of deep but its true. This is a short read but there is an emotional backing that keeps you invested in this book. I loved how the author was able to pull that in a short amount of time. Because what happens to Bobby and Nia is much more than making a decision of becoming parents. Reading the book as an adult, I still ship it. Out of all the other books in the series, this is the strongest one and it has the most care and creativity in the sense that you are reading the past and the present and from a male perspective. Great review, doesn’t sound like a sleezy book to me. Fab review! I love going back to a book and still loving it after a re-read! I don’t think sleazy either when I read the premise of this book. I love revisiting books that I read years ago! I am glad you enjoyed it the second time around. It is always sad when you don’t. I was worried that I wouldn’t like it lol I think that is why I tend to stay away from re-reads because I may find things I didn’t notice before and they may not turn out right. I love that series! And I would be really hurt if my second read of it wasn’t that good. Well, it is good to hear of someone else who liked it. I just need to reread it already! I will do it soon. This is definitely not sleezy! Great review! I…. Someone called the book SLEEZY?! I don’t understand how that word ever came into play with this book. Beautiful review. I always wondered whether I should continue the trilogy, now I might. Exactly my thoughts as well. The series is worth finishing because Bobby does make an appearance in another book. These both sound like great reads! This is a great review in which you have made some excellent points! Thank you for sharing your thoughts.